This is the third post I’ve done on PUFA. If you missed the other ones, read The Common Enemy in Nutrition and The Problem with PUFA. I think this is an important topic, not because we haven’t heard about it, but because so few people have actually pulled out a calculator and ran the numbers. That is what this post is about. It is time to start adding things up and demonstrate just how easy it is to consume too many polyunsaturated fats when consuming a “healthy” diet. For this chart, I took three recommendations and how they would look across different daily calorie levels. I used the recommendations of The Perfect Health Diet, Chris Kresser and Ray Peat. The Peat number is something I saw repeated in forums, but could not find the original source. It is one thing to say lower your PUFA, but to see the actual numbers is more meaningful. Let us look at the food. In this section what I wanted to do was pull massive amounts of nutritional data together including sample menus to demonstrate that many low-carb Paleo and WAPF diets have PUFA levels higher than those recommended above. Actually I spent a few hours gathering data and building out a spreadsheet, but then I stumbled onto a post CarbSane put together in 2011. In the post PUFA’s, the Primal Blueprint and Low Carb diets, she pulled the numbers from the sample menu in The Primal Blueprint – a book I have spoken highly of in the past – and ran the numbers. It is exactly what I suspected. The Primal Blueprint menus were 8-12% PUFA, which doesn’t line up with the suggestions to minimize PUFA. Now I am sure the sources of PUFA are more healthy than seed oils, but they are still high. This has been bothering me for a while now. Low carb Paleo and WAPF preach against the PUFA, but few have bothered to pull out a calculator to see if their sample menus line up with their own recommendations. I’ve been very good about lowering my PUFA intake since I returned from my May trip to Ohio. I stopped buying almonds completely. When it comes to meat I favor lamb and beef over chicken and pork 90% of the time. If I am in a restaurant I choose the item that either wasn’t cooked or cooked minimally – even it means choosing the vegetarian option. In fact the only time I get a heavy dose of PUFA these days are at the potlucks thrown by my local Paleo group. When I was deep into Paleo and believed that sugar was evil, I often had a late light snack of almond butter on sliced apples. These days I often eat a half pint of ice cream. Which is the healther? If you interviewed 100 people, I’d bet 99 would say the sliced apple with almond butter. Let us run the numbers. Yes, I often eat 500 calorie snacks before bed. It helps me sleep better. If you believe the premise that excess PUFA over time is stressful to the body and that one should keep their PUFA low (below 2-4%) then the ice cream wins. If however you think sugar is worse than PUFA then the sliced apples with almond butter wins. My opinion changes over time, but right now I think PUFA is a much larger concern than sugar. 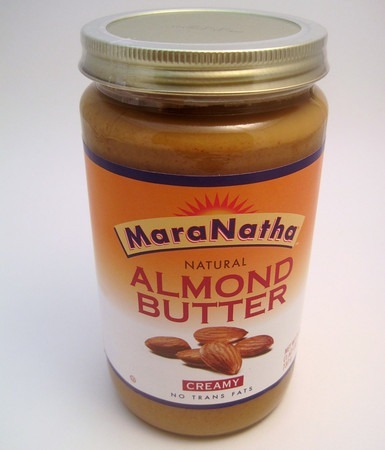 This jar of almond butter has 92 grams of PUFA. I used to go through a jar a week when I was avoiding sugar. That is 13 grams a day of PUFA just from almond butter. When Paleo bloggers talk about nuts in moderation, I don’t think they ran the numbers. Plus I don’t know anyone that can eat just a few nuts and put the bag away. So far all I have talked about has been dietary PUFA, but the real problem might be what is already stored in our fat tissues. We not only need to minimize the PUFA we eat, but get rid of years of eating excess PUFA to optimize metabolism. According to Ray Peat this process can take four years. That is four years of eating very low PUFA while the body processes the PUFA stored in fat. Andrew Kim did a post earlier this year titled The Half-Life of Human Fat Tissue is 600 Days? (FEB 2017: site down) that questions the 4 years and suggests it might be much lower. But the takeaway point should be that the body has a limited capacity for processing PUFA. It will take time. Being on the low end of intake, especially when you first embark on PUFA restriction is mathematically wise. When I ran the numbers, I came to the conclusion that to get to optimal low PUFA levels, a higher carb and lower fat diet made the most sense. You could construct a low carb diet with low PUFA levels, but it would be challenging and quite restrictive. Restrictive diets are fine for a month or two, but a year or more? No thanks. Very nice and important post. Thx for running the stats on that. Noticed any health changes while changing to really low PUFA levels? PUFA seems problematic, but then again similar to sugar, will you be as rigid with restricting it in a few years time? Or will you find a balance as time passes by? SO – did you construct a sample menu as well? I did a quick calculation a few years back which suggested that losing 2lbs a week was potentially the equivalent of 10-14g of omega 6 PUFA daily. The math may be off, but it seems likely that folks in weight loss mode may benefit from paying more even more attention to their PUFA intake. @Stephan – I don’t have enough data, but my body temperature is up slightly as is my pulse. Both positive signs. My fingers aren’t as cold as they were last year. Of course this is just observational. I won’t know for sure for several more months. My sugar restriction was easy back in the day, because I never had a sweet tooth. The PUFA restriction is even easier because of the rules I mentioned in the 1st part. @Beth – Your site is a great resource. Thank you for your comments on my 3 PUFA posts. @MAS, not necessarily related to this post, but since you mentioned it in the comment: what’s your view on Peat’s take on higher pulse? It’s the one thing I can’t reconcile with (doesn’t appear to be backed by most research, too). @Dinis – Great question. From what I’ve read by Danny Roddy, there are 2 ways one can have a higher resting pulse. One is from stress hormones such as adrenaline The other is from a high functioning thyroid. One doesn’t feel good, the other does. This is a good starting point, but it is still incomplete. Athletes will often have lower pulses. Is it due to the stress of their activity or that their muscular gains make the body more efficient at the same pulse – so it downregulates? Also, those that engage in meditation – which is stress reducing – can see reductions in pulse. I don’t know how these 2 examples fit into the pulse model. But at a basic level, if ones body temperature is rising it makes sense that there might be a corresponding rise in pulse. If someone else understands this mechanism better than me, please leave a comment. @charles – I was still adding individual food items to a spreadsheet and estimating what quantity I would consume at a meal. It was taking forever. Then I did a search on some background information, which is when I found the CarbSane post. @MAS – Well, I don’t consider myself an “athlete”, but after starting a more active lifestyle (daily bike commute, basketball once a week, body weight exercises once or twice a week) I’ve noticed my pulse to be on the low side (60, most times 56). I haven’t bothered with temperature (yet?) but I don’t have the cold extremities feeling that some people with low body temp report. I recently got myself a Basis activity/body tracking band, which tracks heart rate, so it will be fun to see how it might change. Regarding PUFA: yeah, I’ve been trying to lower my consumption, too. I don’t really run the numbers of my meals, but I’m already avoiding the worst offenders: nuts (whole) only as a treat, almost no pork and poultry (I rarely cooked pork at home anyway – chicken is down to the scraps I get from my weekly chicken stock), etc. I do find Peat’s 4 grams a bit unrealistic, especially considering he recommends eating eggs – and a single large egg has about 1g. Also, I think most paleo folks – or at least a very large bunch – still preach against omega-6 specifically and not PUFA as a whole (I read some posts now and then about having a high omega-6 cheat meal and then “balancing it out” with fish oil… geez). @Dinis – Same thing here. When I am active, my pulse is lower. I haven’t seen an explanation for this that makes sense in the eyes of Ray Peat. Do you experience any changes in subjective well-being based on PUFA restriction? My current approach to diet is that I care heavily about how foods make me feel and how fat they make me, and am less motivated by optimizing long-term health. I find that eliminating starch and sugar has a huge impact on my energy levels and fat loss – any similar impacts from PUFAs? @Sameer – I have noticed my hands are warmer. My body temperature when I donate blood is up a slight bit. Could be unrelated. It did take a few months before I noticed the effect. I’ve also increased my salt intake a little. Just to clarify. If I lose weight/fat from a diet, the PUFAs stored in my fat cells will reduce correct? So while the half life of fat in our cells could be 600 days from adjusting diet alone, if we exercise and reduce calorie intake, the amount of PUFAs in our cells could be reduced much quicker. Does that sound right? @Sarah – If what Andrew Kim posted turns out to be accurate, then yes provided you are not ingesting PUFA at the same time. I don’t even think you need to be in calorie deficit. Going back to his post he mentions how endurance athletes burn equally from PUFA and sat fat. As long as you are fueling with carbs and sat fat the PUFA will be replaced. The activity will likely accelerate that process. But eating clean is still priority #1. First of all, I wonder what this whole idea that PUFAs are bad come from and what science that really backs it up? Especially the claim that caveman ate 2:1 ratio of omega-3s to omega-6 which is a related issue. Secondly, I recommend the comment section at Chris Kresser for a debate of PUFAs. Feel free to ask or comment on that. Thirdly, my opinion is that the whole way of looking at macro nutrion is flawed. We shouldn’t be looking at fat or even unsaturated fats vs. saturated fats, we should be looking of their constituents. Not even omega-3 vs. omega-6 is selective enough (as one can get a hint of in the link above). The same goes for carbs and protein which should be divided in their constituents. This is the reason the scientific community has so different opinions, they are discussing each topic too widely and not specific enough. The complexity doesn’t stop there, since each nutrition counteract with another, so in that manner one must look at nutrition in a wider more holistic view. Well, time will tell if I’m right.